If you were used to documenting your SSAS model using the MDSchema rowsets, you might have noticed that some of them do not work with the new tabular models. For example, the MDSCHEMA_MEASUREGROUP_DIMENSIONS DMV seems to just return one row per table rather than a list of the relationships between tables. There are a few fields that show IDs rather than descriptions (e.g., ExplicitDataType in TMSCHEMA_COLUMNS, Type in TMSCHEMA_DATA_SOURCES). I’ve been able to figure out the descriptions that correspond to some of the values, but I’m still missing a few. As with the MDSCHEMA DMVs, the TMSCHEMA DMVs can be used to document your model. This also works with Power BI models. You’ll just need to change the connection information to your Power BI instnce while the .pbix file is open in Power BI Desktop. 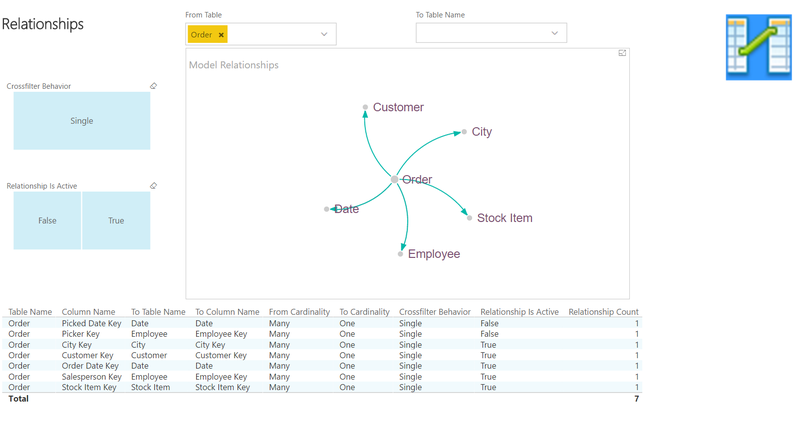 For more information analyzing your Power BI model, see Chris Webb’s post. 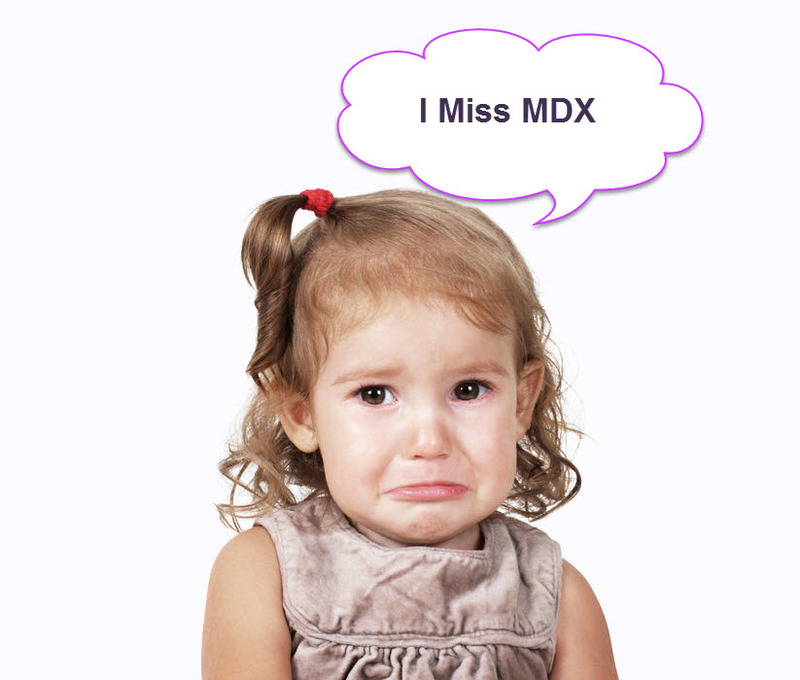 Since DMVs require DMX queries, you are somewhat limited in your ability to join the data from the DMVs together. This makes it necessary to store the data somewhere before transforming and merging them. Since I needed to document a tabular model for a client, I created a Power Pivot model in Excel 2016. You can download my documentation model here. My example model was connected to a quick demo SSAS model I made based upon the Wide World Importers DW database. My Power Pivot model uses Power Query to import the data from the DMVs. This enables me to merge data into a model that I feel makes the most sense and doesn’t suffer from too many relationships and hidden tables (which is what would happen if you just imported the results of each DMV query into the model). In order to make this work for any model, I employed a trick I learned from Chris Webb to avoid duplicating connection information across queries. I built my model with the normal embedded connection strings and then converted them to use the connection Connection Info tables. As I did that, I ran into a Power Query limitation as evidenced by the error message below. Ken Puls has a great explanation of how to get around this issue. Basically, you have to redesign your queries so that you have “staging tables”, which you can then use to build finalized tables. This redesign gets you around the error since the finalized tables don’t have the embedded source connection, just a reference to the results from another query. The Database Info tab uses cube functions to display the values shown. The rest of the tabs use pivot tables and slicers. You can download and use this model if you have Excel 2016 or 2013 with Power Query. Just download the file, change the values in the TabularInstanceName and TabularDBName queries, and refresh. I was able to open the file and update the queries with no issues and no changes in Excel 2013. This is great if you just need documentation or a quick way to look up specific information. But we could really analyze this using visualizations other than tables in Power BI Desktop. I imported the Excel model into Power BI, made a few adjustments, and then added some visualizations. This report is a bit paired down from a visualization standpoint compared to the Excel file because I eliminated some of the data that wasn’t analytically relevant for me. 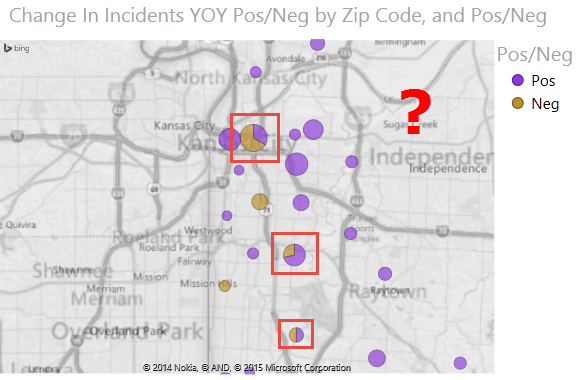 Click here to view this report in Power BI. On the first page, I have several summary numbers that tell me about the contents of the model. It gives me a decent idea of the size and complexity of the model. The second page uses a bar chart as an interactive filter against a list of table source queries and columns. The third page shows relationships between the tables. Slicers on the left filter both the force directed graph and the table. 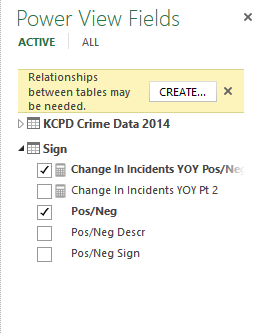 Smart filters at the top of the page let you filter the Table and To Table in the relationships. The fourth page shows the details behind each measure. A column chart at the bottom provides a count of measures by table and whether the measure is hidden, which acts as another interactive filter. 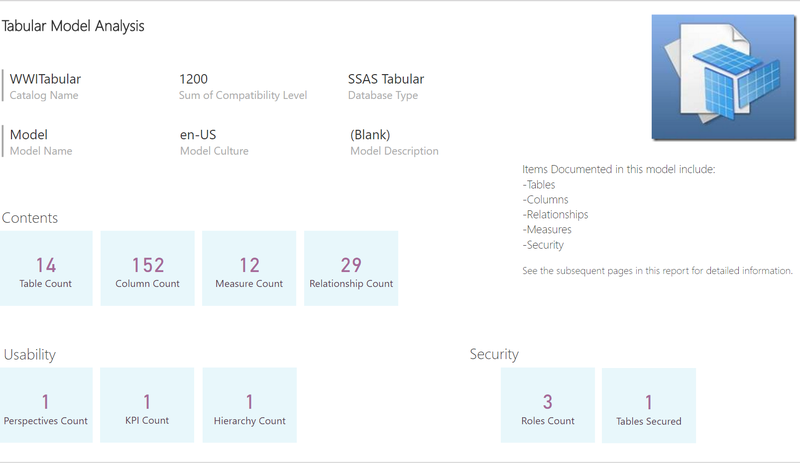 The last page shows security by role and table, again using column charts as interactive filters. Check out the Demo Day video I made on the BlueGranite blog for further explanation and a demo of the Tabular Model documentation. Update 19 Sep 2017: I have turned the Power BI report into a Power BI Template for easier use. You can download it here. Power View can be a good tool for interactive data visualization and data discovery, but it has a few limitations with its mapping capabilities. 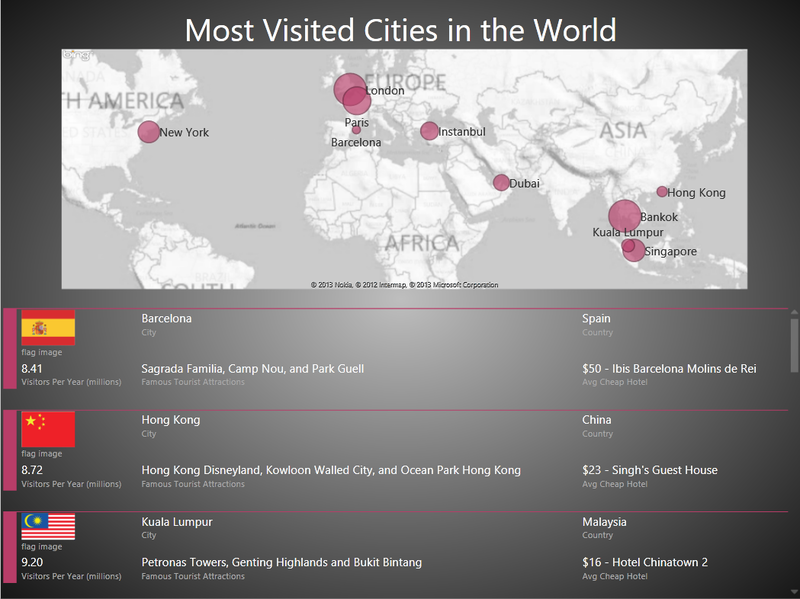 Power View only visualizes data on maps using bubbles/pies. The size of the bubble on a Power View map can be misleading during analysis for data sets with small values and negative values. By default, Power View can only display one measure on a map, which it uses to determine the size of the bubble. Microsoft offers other mapping capabilities in Power Map and SSRS maps, so if all you need is a map, you can explore those other tools to determine if they better meet your needs. Check out my presentation on Choosing Your Geospatial Mapping Tool for more info on requirements, capabilities, and limitations of maps in Power View, Power Maps, and SSRS. If you want to see a map in the context of other charts, and you want the interactive highlighting and filtering of Power View, you may look for workarounds to the second and third issues listed above. I recently had a client express disappointment about the display of negative values in Power View maps. A negative value simply gets a small bubble, and positive value gets a larger bubble. You have to hover over the bubbles to see each value and understand the bubble size that represents the change in sign from positive to negative. This gets a little tedious and minimizes the usefulness of the bubble map in the first place. 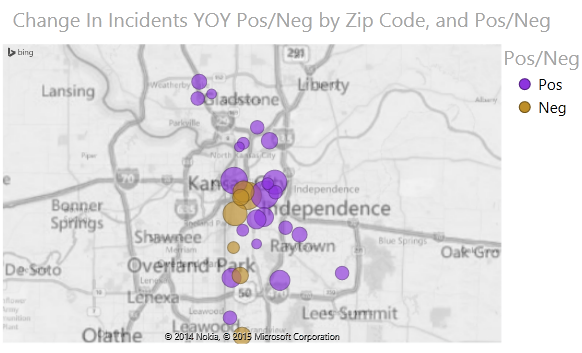 The example Power View map below shows the year over year change in trespassing incidents in my city from 2013 to 2014. The small bubble has a value of -16, and the large bubble to the right has a value of 6. One way to better present this type of data in a Power View map is to have positive values represented in one color and negative values represented in another with the bubble sizes showing the absolute value of the change. This proved to be less than straight forward as I worked my way through it. 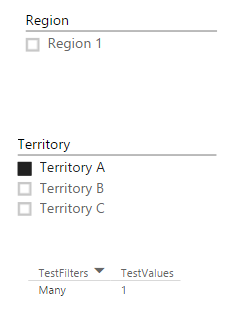 You can’t just make separate measures for the positive and negative values because Power View won’t let you put two measures on a map in that manner. You can’t simply create a calculated measure that determines the sign of your values and put it in the legend because Power View is expecting categorical data for the legend and it won’t let you put the numerical data field in the legend. Power View also doesn’t recognize calculated measures that return a text value (they don’t show up in the field list), so you can’t create a measure that turns the sign into a text value (“Positive” or “Negative”) in an effort to make it more categorical. a field for the maximum value of the range. The video shows storing that table in Excel (which is great if you plan to make changes), but you can now also paste the table directly into Power Pivot without any link to the table in Excel. My final table looks like the image below. 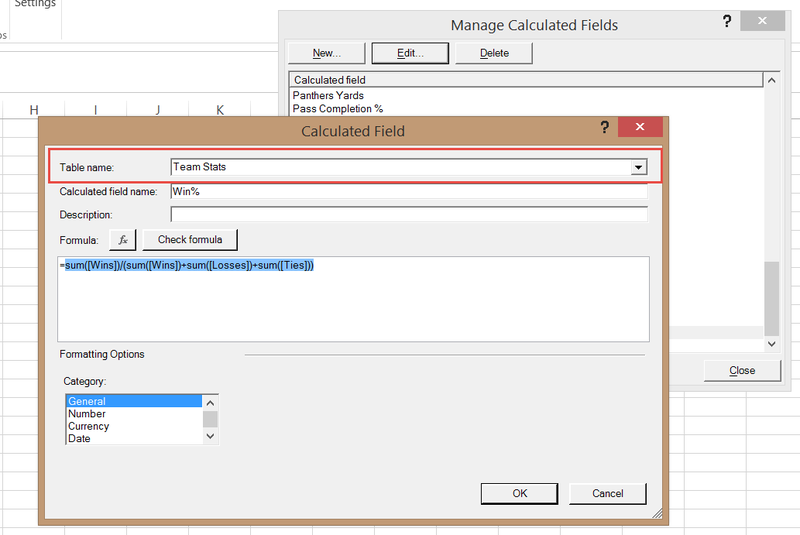 Next you need a calculation that uses the disconnected table and displays the absolute value of the measure you want to use for the bubble size. Then you can build your map. Use the Pos/Neg field for color, the new calculation for size, and your location fields of choice. Note that you will now see a warning message in the Power View fields list that relationships may be needed. You can disregard that. The use of a disconnected table is the cause of that message, and everything is working as intended. If your map has no drill down levels, you can stop here. Your map will now have the values for positive and negative in the legend with bubbles of two colors on the map. A bubble whose signed value is 5 will be the same size as a bubble whose signed value is -5 with the color indicating the sign of the number. In this analysis, a positive number indicates an increase in trespassing, so I chose a theme and ordered my values in the sign table such that the positive values were assigned the brighter color. These are the bubbles that need attention since trespassing is rising in the related zip codes. If you do have drill down levels in your map, you have a couple more steps. You need another measure that deals with the drill down path. Without this extra step you end up with pies and unexpected values. My map allows the user to drill down from zip code to beat. My new calculation references the top level of my drill down path ([Zip Code]), the calculation I just created ([Change In Incidents YOY Pos/Neg]), and the second level of the drill down path in my map ([Beat]). Note that this calculation is specific to the drill down path used in the map. If you have several maps with different drill down paths, you will need to create several calculations for this to work. Now I can put this new measure in place of the original one, and the pies will go away, returning the expected color coded bubbles and values. I have been working on a project in which we were looking at durations as an indicator of service levels and customer satisfaction, specifically the maximum duration and average duration. We built a small dimensional data mart in SQL Server to house our data, then pulled it in to Excel using Power Pivot so we could make a few Excel and Power View reports and provide the client with the model for further ad hoc reporting and analysis. After the first iteration of development, we got feedback from the client that there were several outliers that were skewing the metrics. They wanted to see average and max duration for whatever group of objects they had chosen and then see the calculations after removing the top and bottom 5% of values. Here is a small sample of my fact table, called Object Processing. Field names and some small details have been changed to protect the innocent. The first four columns are foreign keys to dimensions. The object dimension contains an object ID, name, owner, and content group. The status dimension contains an ID and description of the current processing status. The date dimension is a standard date dimension representing the date the object was created. The geography dimension contains an ID, country, and region. The duration column represents the number of seconds the object has spent processing. A new row is inserted into the fact table for each object created. To remove the outliers we need to rank the objects by duration. I first read Alberto Ferrari’s blog post on dynamic ranking in Power Pivot. It demonstrates a method to rank items within the table as a calculated column, which didn’t quite work for me because I wanted to dynamically rank items after filters were applied (ex: rank only the objects with a create date of yesterday and a status of completed). Then I found a series of posts on PowerPivotPro.com about Dynamic TopN Reports Via Slicers (parts 1, 2, 3, 4). That was what I needed to work through my similar problem. First, I created a calculated measure for ranking the objects. If an object had no duration (because it had been created but had not yet reported a duration), I wanted it to be blank rather than rank as the lowest duration. In this formula, I’m ranking Object IDs in descending order based upon my total duration calculation. Now I could filter my pivot table containing the Is In Range calculation for only those values equal to 1 to see the average and max duration with outliers removed. Ultimately, I produced a summary report similar to this: We were able to compare object durations for objects created in the last 1, 7, and 30 days, including and excluding outliers. The conditional highlighting is set so that cells are highlighted if the duration for that time period is greater than the duration for the prior time period listed below it. For example, average object duration for yesterday is 5:06:02, which is greater than the average duration for the last 7 days of 4:54:14. I’m still working on a DAX calculated measure that will return the average object duration excluding outliers in one fell swoop, rather than needing to filter out the outliers in a pivot table.